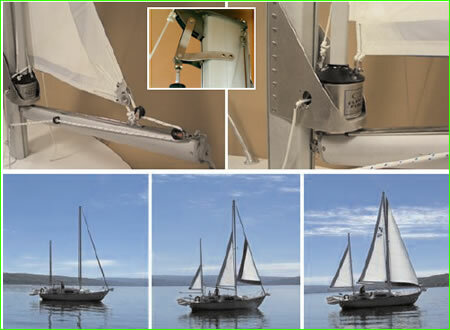 Cruising Designs offers this affordable Behind-the-Mast mainsail reefing system that can easily be owner installed. This system is based on the proven reliability of the CDI Flexible Jib Furler. CDI is known for practical and reliable cruising products. Mainsails up to 400 Sq Ft. Backed by a 6 Year Warranty! Now your mainsail can be set and reefed from the safety of your cockpit as easily as the furling jib. The Mainsail Reefing System eliminates the precarious job of climbing up on the cabin top in a rolling seaway to raise and lower the mainsail. No more lazy jacks to snag and no more loose Dacron spilling into the cockpit or obstructing your visibility. As with Jib Reefing the Mainsail System allows infinite size control to accommodate all wind and sea conditions. The added convenience of CDI System allows you to quickly set and adjust the mainsail on a moments notice. You will enjoy your mainsail more often and sail safer too.The next time your engine fails at a critical moment you can just set the main and sail out of danger! The Mainsail Reefing System is designed for easy installation on a wide size-range of boats without the expense and complexity of in-boom or in-mast systems. Click here for complete owners manual and installation instructions. Oops! We made a mistake in our 2011 Print Catalog and published and incorrect price for the MR4/6 Mainsail Furler. We are very sorry, it was an honest typo and we did not mean to mislead anyone! The price here is correct. Purchase a new furling mainsail within 30 days of receiving your CDI Mainsail furling system and you will be eligible for a package discount just as we do with headsail combination packages. Due to variables system installations we recommend installing first and then measuring for the mainsail. We can provide package pricing in advance based on your old mainsail measurements and then make the new furling mainsail to order after you have completed the final measurments. Click here for complete owner installation manual and sail fitting instructions. For more information and package pricing please call The Sail Warehouse at 831-646-5346. Have your old mainsail dimensions available when you call.